So? That is one of the last priorities in a monitor to me. Hope they make a FreeSync version, but it will be probably way too expensive. Now this is a new one on me... is this supposed to actually mean something, anything, or just some silly marketing mumbo-jumbo ?????? So, this is a PG278Q (released back in 2015) again, with the added E. What is the difference? "looking at its 170°/160° (H/V) viewing-angles, we guess it could be TN-film based"
Most likely a wrong guess based on the previous model being IPS. PG278Q is TN, PG279Q is IPS. PG278QE with 170/160 viewing angles is definitely also TN. I guess that depends on what you consider being "gaming". If its purely performance, ya know, the people that run state of the art hardware but turn all graphics to as low as possible just to get as many frames per second as they can, then sure a TN panel would be fine. For me however, I dont care much for that, I want it all to look good and with IPS's better colour space/reproduction etc, id rather have that. True.had an ips but couldn't stand the blb even though there wasn't much.if you're paying so much for ips then any bleeding is unacceptable.plus ips have no black color.people may think what they see is black but it's far from what you get on a va.
You're correct,better to settle for a nice tn with good gamma control,i'm very satisfied with my acer predator. It's got nothing to do with your preferences.It's a great feature and if you put power consumption ovet ulmb you got your priorities wrong. Interesting how the power consumption has more than doubled on this screen and is exactly the same as the previous IPS version. I'm not convinced adding an earphone jack accounts for that. Note how ULMB/strobe is four times as 'fast' as a 120hz native render. PG278Q that was release in 2014 is the first version and still considered one of the best 1440p 144-165Hz G-Sync TN monitor. Probably only one model that is free from the famous color banding issue. PG278QR was release in 2017 and was update to 165Hz. This model is inferior to the first version. It suffer from huge color banding and clouding issue. Also aggressive panel coating could be a deal breaker for many people (The first model only use medium coating). I guess PG278QE may try to address the problem of PG278QR. The later 1440p 144-165Hz TN panel from AUO seem to be much better at banding than early model. For example the ASUS counterpart Dell S2716DG was also suffered from huge color banding issue on early revision. It was mostly fixed on A08 and later revision. Also Dell S2719DGF which continue to use TN from AUO is completely free from color banding issue. PS. TN panel is not always bad. Once properly calibrated (2.2 Gamma / 6500K White Point / 120 cd/m^2) the colors can looks good especially on newer 8 bit TN. The remaining issue is still gamma shift but that is just a natural trait of TN. Also any blur reduction technology work best on TN. There is none to less strobe crosstalk compared to moderate crosstalk on IPS and severe crosstalk on VA. When you buy a monitors you have to pick poison bottles anyways. I can't stand against black crush and slow response time on VA that cause ghosting / inverse ghosing / strobe crosstalk. While I can live with gamma shift on TN and moderate level of black light bleed / IPS glow. So it is only TN or IPS for me. In the end I choose TN because price different is big at that time. 1440p 144-165Hz G-Sync TN cost $500 here while I need to spend another $400 for the same specs but being IPS models. A few notes about crosstalk. I'm not seeing any of it on my VA here; two key elements: 120hz instead of 144 or higher, and (ambient) temperatures. A warmed up VA is noticeably better at it, it gets 'faster' and that also eliminates quite a bit of the smearing you see in darker hues. But you're absolutely right otherwise, every panel tech is a trade off. My priorities are straight on point on what I need. Who are you to say otherwise, you don't know what I do, where I live nor who pays my electrical bill. very good — with beautiful CRT-style motion clarity, no microstutters, and no noticeable double images. very bad — with distracting side effects such as double images (strobe crosstak), poor colors, very dim, very microstuttery, flickery. Yes, but it is as so many things an option. And if you're in the market for a high refresh rate display with variable sync you're already in a situation where you would be switching display modes and options all the time, and prices are similar. 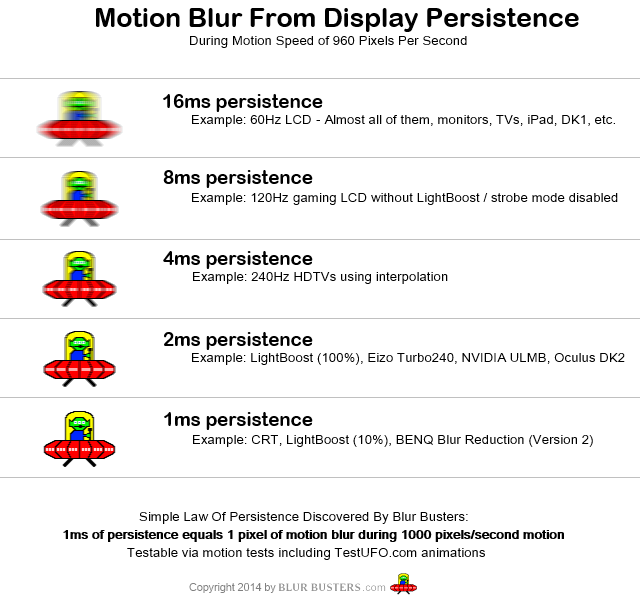 ULMB / strobe implementations do differ, as do all other monitor qualities. It just seems strange to omit a key feature for a high refresh rate display, because simply put, IPS without strobe can't even properly keep up with 144hz in G2G, all the high refresh gets you is more blur - or more ghosting from overdrive, which really looks about the same. Strobe Crosstalk = Can't really do much on most monitor. Some that can adjust overdrive level may help reduce crosstalk. But most likely you will depend on panel type and manufacturer's mercy. The only blur reduction tech that allow user optimize to reduce crosstalk is BenQ DyAc. While ULMB is more like plug and play. Poor colors = Not so much for modern blur reduction. This is not the day of Nvidia Lightboost. Gamma may skew a bit like from 2.2 to 2.3. Solution is calibrate monitor both normal mode and ULMB mode. Very dim = On older models like PG278Q (2014) I would still say not likely. These old models still capable of hitting 120 cd/m^2. Should work find on most room unless you want to use monitor outdoor. On newer models like 1080p 240Hz TN G-Sync they can hit 250-275 cd/m^2. Overkill anyways. Very microstuttery. Yes if you play unoptimized games that have poor / not smooth frametimes because in ULMB mode there is no "blur" to mask those stutter. Flickery = depend. It is not as high as older monitor that don't use some kind of flicker free. This is personal preference. Some may OK with it while some may avoid it. wow CRT is still king ? Wow, that is really nice. My only concerns are are the cost and gaming compatability.